The Smithsonian recently collected an EV1—an all electric car, built in 1996. The sporty two seater joins a collection that has been growing since the Smithsonian acquired its first car—an 1894 Balzer—in 1899. Both the first and the latest vehicle to join the collection are experimental vehicles, but in the intervening 100 plus years, the landscape of automobility in the United States changed significantly, making what counts as an experiment a very different kettle of fish. When Stephen M. Balzer built his “experimental 4 wheeled road carriage,” most Americans had never seen a horseless carriage, and the vehicles that would come to be called automobiles were a new and fluid technology with an as-yet uncertain future. Inventors used a wide range of styles and different fuel sources, and there were few agreed upon conventions. Some cars had steering mechanisms (usually wheels or tillers) on the right, others had them on the left. Most cars were open top. Lights, windshields, horns—all kinds of features we take for granted now—were not standard parts of early vehicles. In a very real sense, in the late nineteenth and early twentieth centuries, all cars were experiments. In contrast, when General Motors Corporation set out to reintroduce all-electric passenger cars to U.S. motorists at the end of the twentieth century, the United States was teeming with automobiles and there was an average of one car for every licensed driver in the country. Cars came with all kinds of standard features and conveniences that consumers had grown to expect as a part and parcel of their motoring experiences. Any experimental car would need to have those features if it were to compete, or the public would have to be persuaded that such a car without them could be just as useful as any gasoline-powered vehicle. Furthermore, in the early years of automobillity, the search for fuel could be a challenge for gasoline and electric motorists alike. Very quickly, however, gas companies built a thriving network of stations that created a convenient fueling system for gasoline automobiles. Electric cars also needed an infrastructure of fueling places if they were to become a significant part of the 21st century automotive landscape. Obviously, Maynard was wrong. Manufacturing automobiles quickly became an important segment of the American economy and helped shape the ways that U.S. factories and firms did business in the twentieth century. Additionally, the postwar consolidation of the world's automobile production into the hands of a few carmakers has meant that names like “Oldsmobile,” “Ford,”and “Toyota” have come to mean a lot to consumers. Not surprisingly, the big American automakers are well represented in the museum's collection. The museum owns a number of early automobiles—such as Oldsmobiles, Cadillacs, and Ford Model Ts—that were made by manufacturers that have had long-term commercial sucess. Those manufacturers and models became a part of the country's popular culture in the early twentieth century and remain a part of the nation's automotive landscape in the twenty-first century. The museum's collection also contains a number of experimental cars, a number of cars that were produced in relatively small numbers, and some brands that gained favor for a brief period and then failed. There were hundreds of auto manufacturers in the early twentieth century, and although you might never have heard of Franklin, Kelsey and Tilney, Riker, Balzer, or Winton, these “unsuccessful” automobiles can help us understand American history in all its richness and complexity. The first car the Smithsonian Institution collected was an experimental gasoline-powered automobile. Designed and produced by Stephen M. Balzer, this 1894 Balzer automobile was technologically interesting—it had a rotary engine—but Balzer never mass produced motor cars, and the Balzer Motor Company was not a commercial success. Elwood Haynes sitting in 1894 experimental gasoline automobile, the "Pioneer". In 1910, Elwood Haynes donated a car to the Smithsonian. The Haynes “Pioneer” was test driven on July 4, 1894. This car, although not the first American-made automobile, is one of the earliest made cars in the museum's collection, and is also gasoline powered. In contrast to Stephen Balzer, who got out of the car business in 1902, Elwood Haynes stayed active in the business until his death in the 1920s. The Haynes Company did relatively well in the early twentieth century, but like many auto companies of the time, it failed during the 1920s. Building a gasoline car didn't guarentee sales and a future in the automaking business, some of the car companies that failed in the early twentieth century backed the wrong horse when it came to fuel type. Inventors and manufacturers built steam, gasoline, and electric cars. Gasoline has its problems as a fuel—it is inflammable and emits pollutants, to name but two of them—but gasoline-powered vehicles became the norm within a generation. Electricity was a new technology in the late nineteenth century, and its modernity may have made it appeal to urbane city residents. City dwellers were the largest market for electrically powered vehicles, since such cars operated best on smooth roads and over short distances. Electric cars were quiet and easy to drive, and they were often seen as a replacement for a carriage for the wealthy: many early electric vehicles look like carriages. But electric cars had disadvantages: they couldn’t go very far between charges, batteries needed maintenance and wore out, and you couldn't carry a spare can of electricity in your car. Bad roads also limited electrics' usefulness. Steam power had been harnessed for factories and for railroads in the nineteenth century. Of the three main fuels for automobiles, it was the most tried and true. But steam didn't work as well for small personal transportation as it did to fuel large locomotives. Steam cars took time to warm up and be ready to drive, and the boiler that made the steam could explode. Steam cars were initially popular but they faded from the market. The Smithsonian's Locomobile in about 1906, outside the home of Mrs. H. H. Smith. Mrs Smith's twins are seated in the car. After the technologically fluid early years, automobiles became remarkably uniform in a relatively short time. The front-engine, shaft-driven, internal-combustion car appeared by 1901 and became the overwhelming choice of motorists by the 1910s. Gasoline-powered vehicles dominated the market for most of the twentieth century. Yet, individuals and companies continued to experiment with different motor fuels and other types of innovation did change vehicles over time. The Smithsonian's collection includes a number of experimental and innovative vehicles that were created after World War II, when the automobile industry was mature. The reception of these experiments—notably the EV1—suggest that it is hard to change automobiles' fuel source after the infrastructure for building, maintaining, and fueling gasoline-powered vehicles became so deeply embedded in the landscape and culture. Furthermore, by the end of the twentieth century, most people had grown to expect cars to behave in certain ways, and to have certain attributes, and that seems to have limited the accceptance of alternative fuels. Gasoline and tires were rationed during World War II, and the supply of passenger cars dried up as factories converted to wartime production. Immediately after World War II, pent up demand for automobiles helped give independent car companies like Nash and Studebaker a larger share of the business. A number of new players tried to enter the automobile business, as well. The west-coast based Kaiser shipping company created Kaiser-Frazer, which began making cars in Detroit. 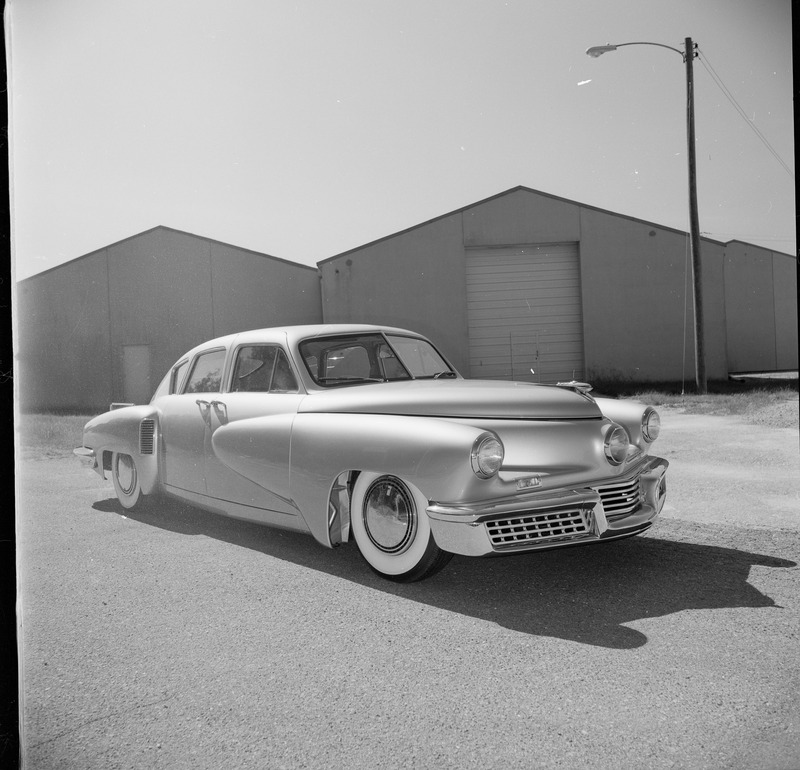 In Chicago, Preston Tucker started the Tucker Corporation. This 1948 Tucker was promoted as an entirely new type of car. It has a rear-mounted, aluminum alloy engine (a modified helicopter engine) and an electrically-operated manual transmission. Safety features include a windshield designed to pop out in a crash, a padded dashboard, and a center headlight that turns with the front wheels. It had padded disc brakes, independent four-wheel suspension, and an area where the front passenger could crouch in the event of a collision. Still, the most striking feature of the Tucker is its avant-garde styling, which provides an impression of futuristic speed and power. Only 51 of these sedans were ever built. This one is number thirty nine. It had a top speed of 120 mph and its Odometer reads 11,721 miles. The car shown here passed through numerous owners and had been repainted and reupholstered. It was seized in 1992 by the U.S. Marshals Service following a narcotics investigation by the Drug Enforcement Administration and transferred to NMAH the next year. American attempts to create new automaking concerns after World War II were unsuccesful, and independents quickly faded from sight. By 1955, the Big Three—Chrysler, Ford, and General Motors—sold 95 percent of the new cars in the United States. Challenges to the Big Three's hold on the market for automobiles came first from German and then from Japanese car manufacturers. Those companies, which gained increasingly large shares of the U.S. car market in the 1970s and 1980s, also made gasoline-powered cars. Although the major manufacturers continued to produce the millions of gasoline-powered automobiles that were the bread and butter of their business, they did conduct a few highly publicized tests of differently fueled vehicles. When cars first became a part of the landscape, the United States sat on huge domestic oil reserves, making gasoline seem like a good cheap source of energy for transportation. Since the end of World War II, as the U.S. has become a net importer of oil, as the number of cars in the country has risen to record levels, and as some people have begun to become more sensitive to the effect of fossil fuels on the planet, the impetus for finding different fuel sources for motor vehicles has been seen as more important in some circles. In the 1960s, Chrysler Motor Company tested a car with a turbine engine with a view toward putting it on the market. Fifty turbine-engined vehicles were produced and tested between 1963 and 1966. Turbine engines powered the jet age, and part of their appeal was that they were “modern.” There were also some potential technological benefits—turbines had fewer moving parts, which should have translated into less maintenance. But the turbine car, although stylish, was inefficient in the stop and go of traffic. Chrysler's fifty cars were driven more than a million miles, but they didn't become a fixture on the postwar transportation scene. 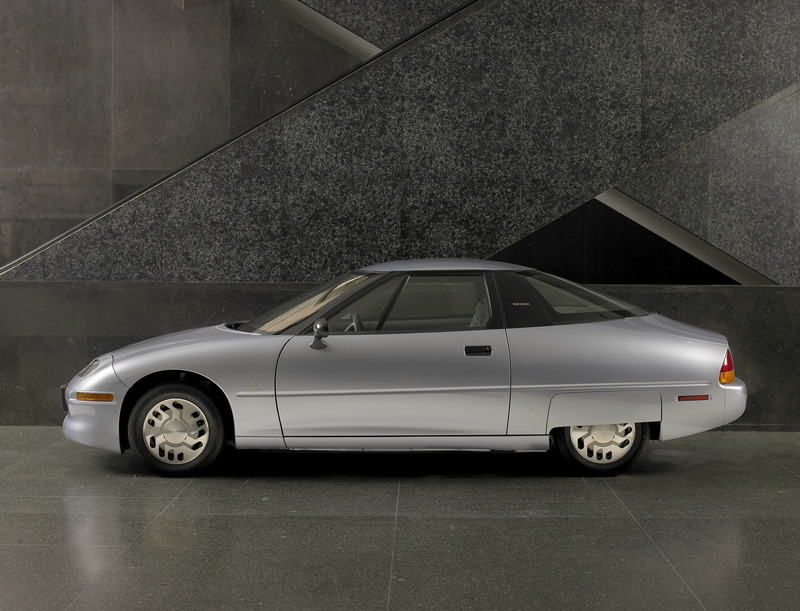 General Motors' EV1 was an attempt to create a zero-emissions electric vehicle (not taking into consideration the emissions from the power plants that produce electricity). The EV1 experiment didn't last long. The EV1 had a relatively short range and a high price tag, limiting its commercial viability. Plus, the emergence and unexpected popularity of hybrid-engine vehicles like the Toyota Prius seemed to many to be much more practical than building a new network of charging stations around the country to replace gas stations. The social and political winds changed, too. Despite the rise in environmental consciousness, many people began to drive vehicles with poor gas mileage—particularly SUVs which, for the purposes of CAFE standards, weren't classified as passenger cars mileage even though people used them that way. It wasn't simply individuals who contributed to the climate surrounding the EV1's demise; the state of California backed away from its demand that a percentage of cars be zero-emission vehicles, making the need for companies to manufacture an all-electric car much less pressing. Although the EV1 had its fans, by 2004, General Motors had called in the leases on the cars, and its attempt to mass market an electric vehicle was over.